The Nullification Crisis was a sectional crisis during the presidency of Andrew Jackson around the question of whether a state can refuse to recognize or to enforce a federal law passed by the United States Congress. It was precipitated by protective tariffs, specifically the Tariff of 1828 (also called the "Tariff of Abominations"). The issue incited a debate over states' rights that ultimately threatened violent hostilities between South Carolina and the federal government, and the dissolution of the Union. This debate was integral to the causes of the Civil War, some suggesting that it was more central than the slavery issue, although the two were related, if determining whether to retain slaves or not was within the province of the State government, not of the Federal government. 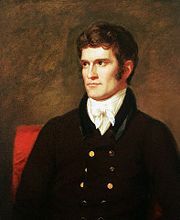 During the beginning of his term, Jackson was forced to confront the state of South Carolina on the issue of the protective tariff enacted in 1828 by Congress to benefit trade in the northern states. It was deemed a "Tariff of Abominations," and its provisions would have imposed a significant economic penalty on South Carolina if left in force. The tariff made imported manufactured goods, previously cheaper, more expensive than those made in the North. Business and farming interests in the state had hoped that Jackson would use his presidential power to modify tariff laws they had long opposed. In their view, all the benefits of protection were going to Northern manufacturers. South Carolina's rice industry was indeed in decline, but despite the tariff, its cotton industry flourished as the price of cotton soared, making some of its planters the richest in the country. The protective tariff, passed by Congress and signed into law by Jackson in 1832, was milder than that of 1828, but it further embittered many in the state. In response, South Carolina citizens endorsed the states' rights principle of "nullification," which was enunciated anonymously by John C. Calhoun, Jackson's Vice President until he resigned in 1832, in his South Carolina Exposition and Protest (1828). South Carolina dealt with the tariff by adopting the Ordinance of Nullification, which declared both the tariffs of 1828 and 1832 null and void within state borders. Nullification was only the most recent in a series of state challenges to the authority of the federal government. There had been a continuing contest between the states and the federal government over the power of the latter, and over the loyalty of the citizenry (primarily to the United States or to their state) since the founding of the republic. The Kentucky and Virginia Resolutions of 1798, for example, had defied the Alien and Sedition Acts, and at the Hartford Convention, New England had voiced its opposition to President Madison and the War of 1812, and had discussed secession from the Union. South Carolina also feared that if tariffs on imported good were allowed, that it would eventually infringe on their laws regarding slavery. South Carolina was in the unique position at this time of having more slaves than free people residing in the state. 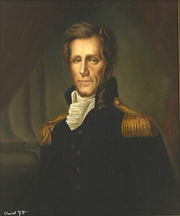 In response to South Carolina's threat, President Andrew Jackson sent seven small naval vessels and a man-of-war to Charleston in November 1832 to augment Federal forces under the command of James Wolfe Ripley. On December 10, he issued a resounding proclamation against the nullifiers. "South Carolina," the President declared, "stood on the brink of insurrection and treason," and he appealed to the people of the state to reassert their allegiance to that Union for which their ancestors had fought. Congress, for its part, passed a "Force Bill" in 1833, authorizing the President to take whatever actions he deemed fit to enforce the law. When the question of tariff duties again came before Congress, it soon became clear that only one man, Senator Henry Clay, the great advocate of protection (and a political rival of Jackson), could pilot a compromise measure through Congress. Clay's tariff bill—quickly approved in 1833—specified that all duties in excess of 20 percent of the value of the goods imported were to be reduced by easy stages, so that by 1842, the duties on all articles would reach the level of the moderate Tariff of 1816. Clay's tariff thus effectively resolved the Nullification Crisis. This tariff is known as both the Tariff of 1833 and the Compromise Tariff. Nullification leaders in the state of South Carolina had expected the support of other Southern states, but the rest of the South declared South Carolina's course unwise and unconstitutional. Eventually, South Carolina backed down and rescinded its action, but not before nullifying the Force Bill. As a result, both sides claimed victory. Jackson had committed the federal government to the principle of Union supremacy. But South Carolina, by its show of resistance, had obtained many of the demands it sought, and had demonstrated that a single state could force its will on Congress. Although none of the southern states backed South Carolina during the crisis, many southerners declared their sympathies to be with the people of South Carolina, and thus the conflict helped enforce the idea of secession which ultimately lead to the American Civil War. As the Unionist, James Petigru, wrote at the time, "Nullification has done its work. It has prepared the minds of men for a separation of the states - and when the question is moved again it will be distinctly union or disunion." In 1860, South Carolina was the first state to secede from the Union. This page was last modified on 14 December 2018, at 15:49.